However much one may love Corgi Toys you do have to wonder quite what planet some managers were on when they chose the colours for their models in some periods! 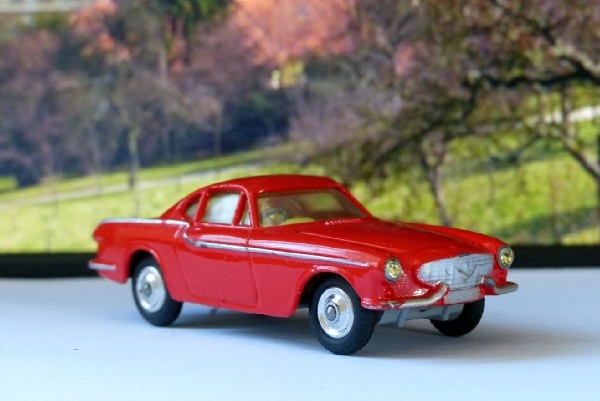 This otherwise impressive sports Volvo, (the car used by Simon Templar no less in white) appears first in a shade of salmon, a shade of sludge and red. The red is usually a quite deep, dark shade but this is a quite scarce bright orange-red. With two jewelled lights and that’s all by way of accessories this is another simple but delightful model. It is virtually as new. There is a factory flaw on the boot but no sign of wear. The silver side lines are good and the windows clear, the wheels shiny with excellent tyres. This also has a lovely original box which is crisp and bright. If you need one of these for your collection you will not find a better example.